Miniature Australian Shepherd is a smaller version of the standard Australian Shepherd. Through the standard-sized dog breed, the smaller one shares the same history and development. However, in the 1960s and ’70s, several people began breeding smaller Australian Shepherds that stood 14 to 18 inches tall instead of the 18 to 23 inches of the original Australian Shepherds breed. At one time there was a movement to call these dogs North American Shepherds. The Miniature Australian Shepherd is an Australian Shepherd in miniature; he is still an intelligent, hard-working, herding dog and is neither a toy nor a lap dog. The eyes are almond-shaped and brown, blue, amber, or marbled. The ears are folded. The body is slightly longer than tall, and the chest is deep. The tail is no longer than 3 inches and is a natural bobtail or docked. The coat is double, with an undercoat that varies according to climate and a medium outer coat. There is feathering on the backs of the legs, the belly, and the neck. Colors include black, red, blue merle, and red merle, with or without white and rust markings. The coat requires twice weekly brushing, more when the dog is shedding. Miniature Australian Shepherd is an active dog breed and needs daily exercise. Although walks are great socialization, they are nowhere near enough exercise. This breed needs to run and play hard. This is a bright, intelligent breed, and training can help channel those traits. Early and continued socialization is important, as Mini Aussies are naturally reserved and wary with strangers. Miniature Australian Shepherd dogs enjoy a variety of canine sports, including agility, flyball, herding, tracking, and search and rescue. 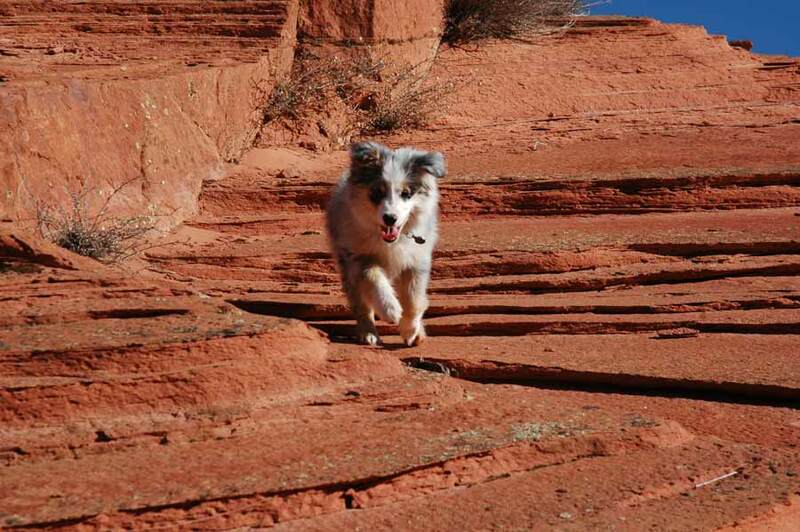 The Miniature Australian Shepherd needs an involved owner who wants to do things with the dog. A Miniature Australian Shepherd home alone for too many hours will get into trouble. Although good with children, Miniature Australian Shepherds do often try to herd them and may nip legs. They are good with smaller pets, although the family cat may not wish to be herded. Health concerns include eye defects and hip dysplasia. Share your Miniature Australian Shepherd story. Note: Upload only Miniature Australian Shepherd picture or your picture with Miniature Australian Shepherd below - spammer's ip may be blocked.